The International Committee of the Red Cross said Tuesday U.S. officials have failed to address concerns about significant problems in the treatment of terror suspects detained at the U.S. military prison in Guantanamo Bay, Cuba. But the neutral agency, which is the only independent monitor allowed to visit the facility, refused "to publicly confirm or deny" a New York Times report that the ICRC determined the U.S. military used psychological and physical coercion "tantamount to torture" at the prison. The allegation was contained in an ICRC report to U.S. officials after visits to Guantanamo, the Times said. A Pentagon spokesman in Washington confirmed Monday that Red Cross officials have "made their view known" that the indefinite detention of terror suspects at Guantanamo amounts to torture. But the Bush administration on Tuesday rejected the ICRC accusations that detainees were in any way abused. "We strongly disagree with any characterization that suggests the way detainees are being treated is inconsistent with the policies the president has outlined," White House press secretary Scott McClellan said on an Air Force One flight from Washington to Ottawa. McClellan insisted Guantanamo detainees "were being treated humanely," though he pointed out "the combatants that were picked up on the battlefield" were seeking to harm the United States. The Times said ICRC delegates found during a June visit to Guantanamo that U.S. authorities had devised and refined a system to break the will of the prisoners, using humiliation, solitary confinement, temperature extremes and force positions. Human rights campaigners told The Associated Press they were not surprised by the allegations after the leak of an ICRC report in May describing mistreatment of prisoners held by the United States in Iraq. The ICRC also found that some doctors were telling interrogators about prisoners' weaknesses in "a flagrant violation of medical ethics." "We have said, including publicly, that there are significant problems regarding the conditions of detention and the treatment of detainees in Guantanamo that still have not been addressed by U.S. authorities," chief ICRC spokeswoman Antonella Notari told the AP. "We continue our discussions with the U.S. authorities in this regard." Notari said it was possible ICRC President Jakob Kellenberger would go to Washington soon to meet with administration officials, but no dates had been set. "When the international Red Cross raises issues, we work to address those issues," McClellan said. But he sidestepped questions about whether the ICRC's finding had prompted further study by the administration or further discussions with the Red Cross. Notari said the ICRC was sticking to its policy of discussing the details of its findings with U.S. officials because it found the confidential approach achieved the best results. An agency statement Tuesday said its policy of confidentiality "has made it possible for the ICRC to have repeated and regular access to those held at Guantanamo Bay and to speak with them in private." 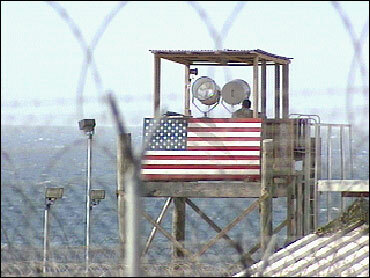 The ICRC said it had been visiting Guantanamo regularly since early 2002. "The ICRC uses its exchanges with governments to make clear its concerns and recommendations regarding the situation in places of detention and to demand changes when necessary," the agency added. "Guantanamo Bay is no exception." Notari told the AP the ICRC saw the recent creation of the Office of Detainee Affairs in the U.S. Department of Defense as a "useful step." The office has provided a forum in which issues relating to Guantanamo Bay can be discussed "in a more timely and systematic manner."